May Malone is said to have a monster in her house, but what Norman finds there may just be the angel he needs. Joe Quinn’s house is noisy with poltergeists, or could it be Davie’s raging causing the disturbance? Fragile Annie learns the truth about herself in a photograph taken by a traveling man near the sea. Set in the northern English Tyneside country of the author’s childhood, these eight short stories by the incomparable David Almond evoke gritty realities and ineffable longings, experiences both ordinary and magical. In autobiographical preludes to each story, the writer shows how all things can be turned into tales, reflecting on a time of wonder, tenderness, and joy. I'm a big fan of the creative--being an English teacher, I often encourage my students to think outside of the box, to do what has never been done, to write in a way that blends genres. That is exactly Almond's strength in this book. 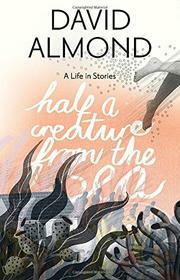 Almond blends non-fiction with fiction and fantasy against a backdrop of illustrations. The very first page is poetry which moves into autobiography which then moves into fiction. Very clever and refreshing, and the short stories are more accessible to a wider audience. Let's face it--in today's technological world, our attention spans are pretty short; therefore, short stories (and beautiful ones at that) are perfectly appropriate. I've already decided to use the book in my classroom the next time that I teach autobiographical writing as Almond excels at displaying the writing process. The multigenre approach highlights the poetry and prose after each autobiographical forward. There's monsters, magic, and adventure wrapped into eight masterfully told stories.